I’m at a customer-organized conference in San Jose, today, called UnJiveWorld 2015. My #workstyle has me out visiting @jivesoftware customers and future customers. I’ll post updates on my Jive Community blog from the event, as the day goes on. 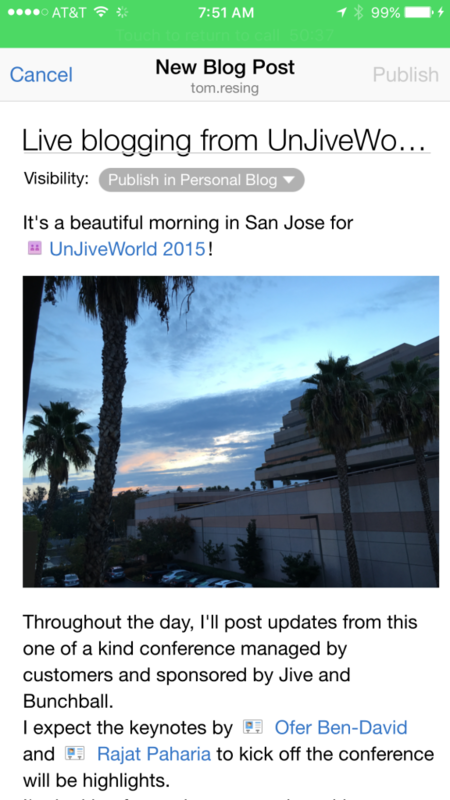 I posted my first blog, Live blogging from UnJiveWorld, straight from the Jive Mobile App on my iPhone. That was so easy, I’ll probably do more updates straight from the phone so I don’t even have to pull out the larger devices.